There's something seriously wrong at Arsenal. A half empty stadium watched another half arsed performance, as we dropped yet more points from a winning position and slipped further into trouble in the battle for a top four place. City's performances are picking up and with Man United ready to pounce on any slip ups, Thursday night football might become a bit more common at the Emirates. Just thinking about a season where Sp*rs are in the Champions League while we exhaust ourselves in the Europa league makes me want to flee the country and live as a Tibetan Monk. 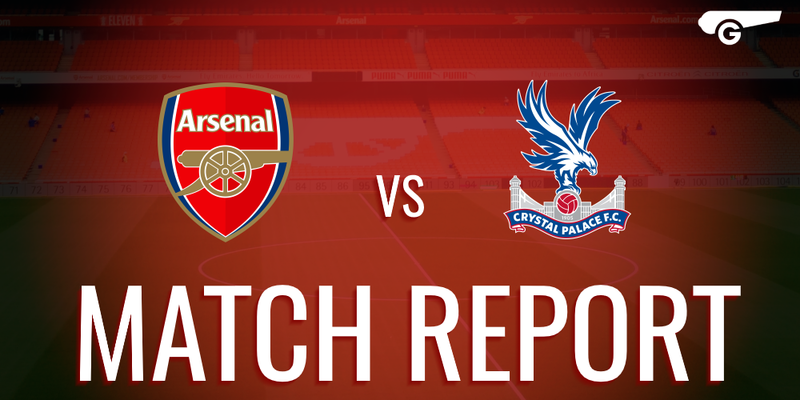 One change was made was made to the team that drew at West Ham, as Cech replaced Ospina. The football was dire as both teams ambled through the first half at a snail like pace. Despite Özil's best efforts to create, our forwards could barely turn his passes into half chances, let alone goals. After 45 minutes of uninspiring play, it was a surprise when Danny Welbeck conjured up a bit of magic, clipping a perfect ball in behind the defence that allowed Alexis to loop a header over the keeper. Hardly a richly deserved goal, but a welcome one nonetheless. After the Palace goal the team rallied gallantly and laid siege to the opposition goahahaha no just kidding, they carried all the threat of a soggy lettuce and meekly probed until the referee had enough and told them to piss off back to the dressing room. Boos rang out and you can hardly blame those who were still there for doing so. Quite frankly the situation and the performance deserved it. I think we have a big problem at Arsenal at the moment. The club seems to have stalled completely, at a time where it is more important than ever to progress. Leicester are on the cusp of winning the league, with Sp*rs challenging them and teams like West Ham are threatening to make the top four, while Chelsea, Liverpool, United and City have had poor seasons of various degrees. The problem is twofold. Firstly, The aforementioned clubs will all react strongly to their disappointments, meaning huge investment. City have already secured Guardiola and will have untold millions to help him build a squad to dominate domestically and in Europe, while Chelsea will probably embark on a major overhaul following their travesty of a campaign. Klopp will undoubtedly start trying to mould his own squad for his brand of football at Liverpool and United will go on their customary spending spree to strengthen all their weak positions. The difference between these clubs and Arsenal is that everything they'll do in the summer will be geared towards winning and building a winning team. For a long time now, Arsenal's approach has been geared towards securing the biggest bank balance possible to appease Kroenke while Wenger maintains a respectable league position. The second problem is the 'Leicester effect' that could ripple through the league. Suddenly a lot of teams are going to have a lot of money from the TV deal and a belief that they too can do a 'Leicester'. Managers like Pochettino and Bilic are getting the best out of young, exciting players and sadly Wenger doesn't seem to be able to have the same impact on his squad. Let's face it, individually we have a better squad than Leicester and one that should be comparable at the very least to Sp*rs. Yet there is nothing like the sort of buzz and optimism around our squad, more one of acceptance of mediocrity and a lack of belief in their ability to be anything more than also rans. With their thumping win over Stoke, Sp*rs are almost guaranteed to finish above us for the first time in Wenger's reign. If we don't act and make some big, bold changes soon, I fear that they and a whole host of other clubs could well leave us in the dust. I also fear that we could be waiting a long time for any such change to occur.